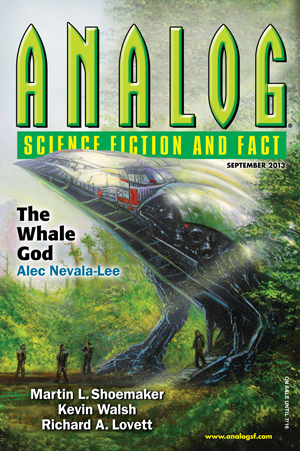 Even a few years ago, I would have been over the moon for managing to sell a story to Analog Magazine. Once Astounding, this is the oldest science fiction magazine in continuous existence, beginning in 1930 and edited during the 40s and later by John W. Campbell Jr., ushering in the so-called “Golden Age” of science fiction. So to sell to to the same magazine as Asimov and Heinlein etc. would have been a big deal for more than one reason. It would also have been a statement of sort, or at least I couldn’t help but feel that way. It would be the first time for someone like me to be published in the magazine, for one. I got used to mailed rejection slips and eventually gave up entirely on mailing manuscripts to magazines. I would only send stories to places that took electronic submissions, and my short story career to date has been dominated by the increasingly-popular online magazines. They were seen as inferior, somehow, less popular, less “serious” in a way. More open to challenging stories would be another way to look at it, of course, and now the online magazines can’t really be ignored, with the American “big three” print magazines increasingly transitioning to digital subscriptions to catch up. Since I have little interest in “problem stories” but rather in actual stories, we clearly didn’t get along any better. We had, I felt, a clash of ideologies. I could live with that – it wasn’t as if, at that point, I was lacking places to be published in. In the meantime, and to my surprise, I did manage to sell one story to Asimov’s – a good but essentially non-confrontational piece (“Needlework”). Then came the news that Analog’s editor Stanley Schmidt was retiring after 34 years. Thirty four years! A new editor, Trevor Quachri, was taking his place. Now, I have to admit I was dubious anything would change. Analog was seen as the last bastion of old-fashioned, 1950s-style science fiction, filled with white men solving space problems with a trusty slide-rule. So it was with considerable surprise – and pleasure! – when I got an e-mail only a month or so later to say Analog were buying my story, “The Oracle” – a Central Station story, of all things! Was Israel even a setting for science fiction? Then, Trevor went one step further, and bought my parody of science fiction, “Whaliens”, for a future issue. It feels very strange to be in Analog. A few years ago, I would have been ecstatic. It would have been a validation, of sort. Now, in a way, it’s just one more publication, but I can’t help see that it is also historic, in some way, if only for me and not for a wider segment of writers. I don’t know. I have mixed feelings – Analog stood for so long for everything I was reacting against in science fiction, that I find myself momentarily lost for words, or sure of what my reaction should be. This entry was tagged analog, central station. Bookmark the permalink. SF is no longer the domain of ‘old men’, men’s men or weirdy beardies. For the times, they are indeed a changing! This is good news,not just for you, but everyone who’s been rejected by analog. I stopped submitting in the late 80s because I perceived a racial bias in their pages. But after reading your blog I guess I just never wrote problem-solving fiction.